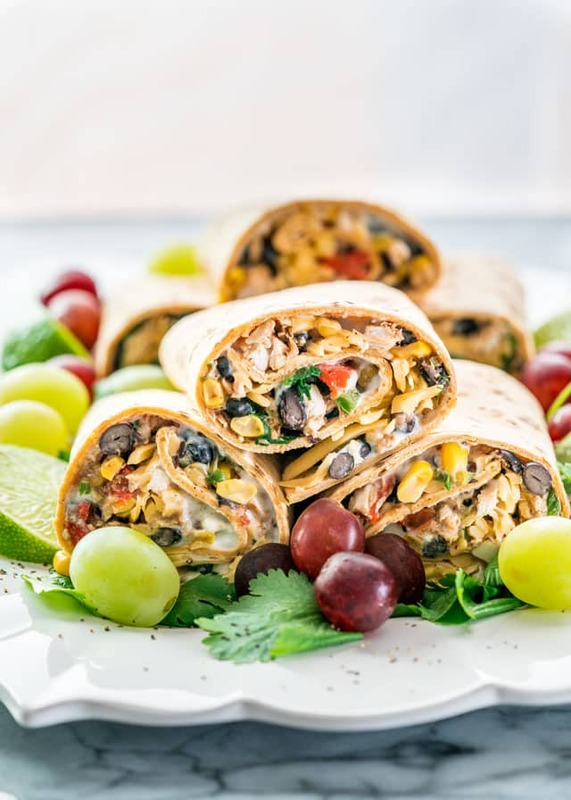 These Southwestern Wraps are packed with nutrition, containing black beans, chicken, spinach, roasted red peppers and a low fat sour cream and blue cheese spread. Easy and nutritious! This post is brought to you by Flatout! Although I’ve been compensated for my time, all opinions are 100% my own. If you’re like me you probably have a million resolutions at the beginning of the year with the main one being eat healthy, exercise more. I don’t know about you but I make a good effort, at least in January, but then Valentine’s day comes, so hello chocolates and sweets and it all goes downhill from there. However, it’s still January, so I’m still good. 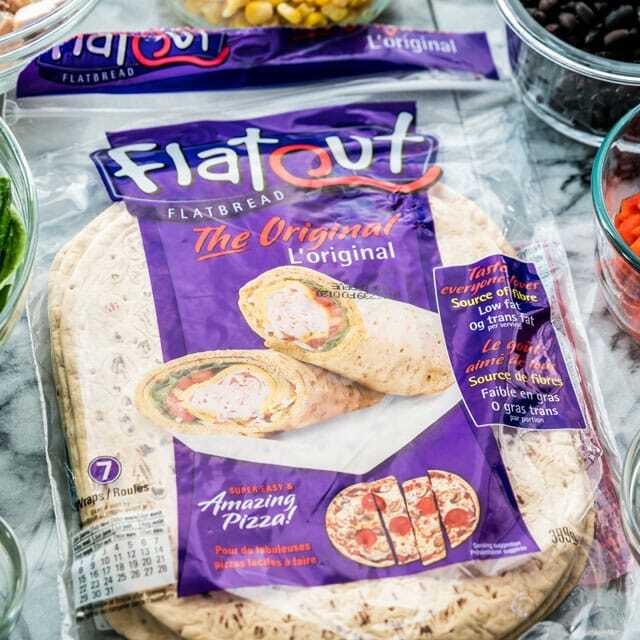 I’m so glad I teamed up with Flatout Flatbread because I’m bringing you an amazing recipe for a super tasty and nutritious Southwestern wrap. 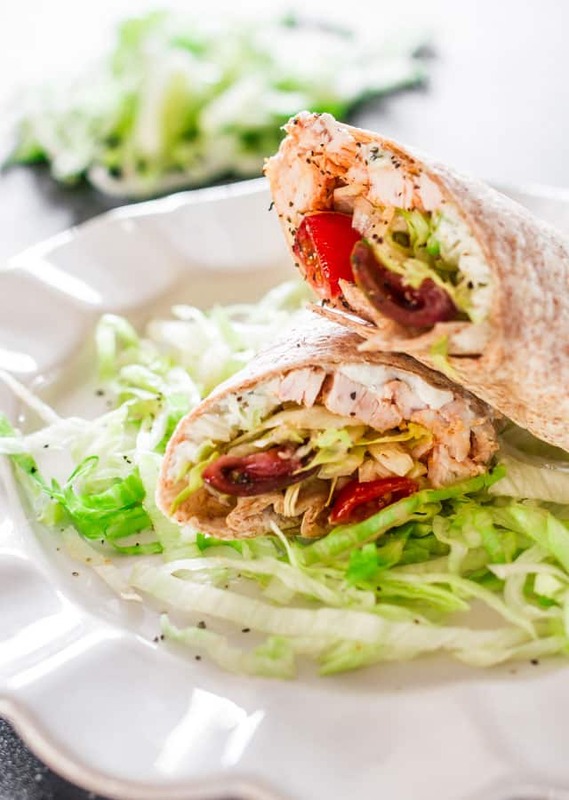 This wrap is so good, you won’t feel like you’re missing out on anything. 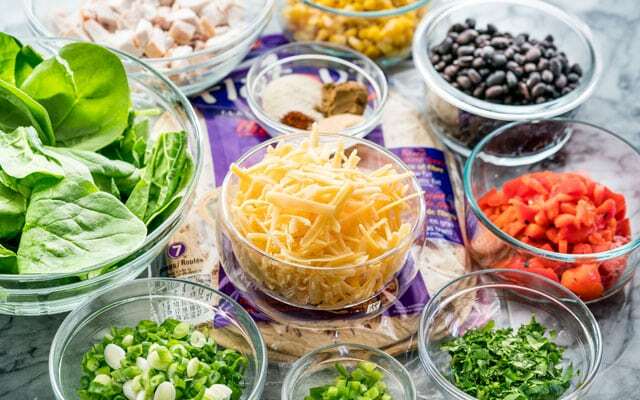 And you’re not because I loaded this with lots of good for you foods, like spinach, black beans, corn, roasted red peppers, cooked chicken breast, green onions and for a bit of a kick I added some jalapeno pepper and a few spices. I did cook all these ingredients, but it’s mostly to warm up everything and to give the chicken and veggies lots of flavor from all the spices. 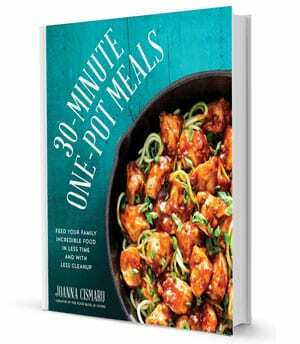 It’s all very quick and really worth putting in that extra bit of time to cook this a bit. I also made a yummy spread with sour cream, blue cheese and a bit of lime juice and I really think all the flavors are really incredible together. Let’s not forget the Monterey Jack cheese because although I wanted to make these healthy, I’m still not willing to skimp on the flavor, but if you want to cut out some of the calories, leave the cheese out. These Flatout flatbreads are perfect in this recipe, they’re my favorite and so much better than a tortilla. I find them a lot softer and more malleable, so to me they are the perfect vessel for the ultimate wrap. 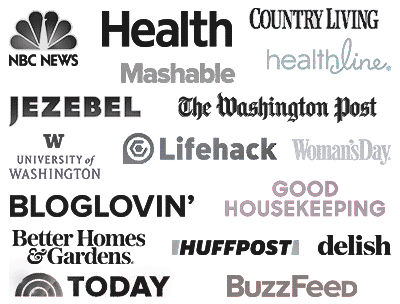 Not to mention how versatile they are, you could make breakfast wraps, veggie wraps, a million kinds of pizzas, even appetizers, the possibilities are endless. 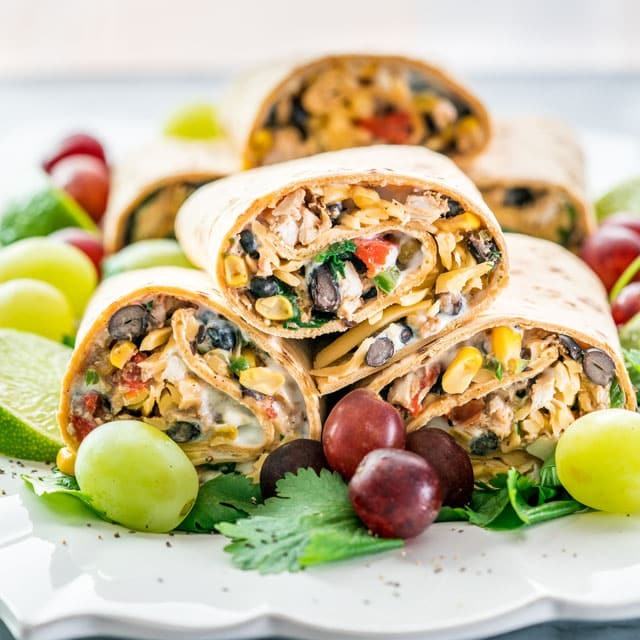 These Southwestern wraps are even better the next day. I stored them in an airtight container and had leftovers the next day. You can even wrap them up in plastic wrap or wax paper, and you’ve got lunch for the next day. You can eat them cold or you could heat them up either in the microwave, or just pop them in the oven for a bit and they will taste even better because they will crisp up and the cheese will melt. So good! Heat the olive oil in a large skillet over medium-high heat. Add the cooked chicken, cumin, chili powder, garlic powder, onion powder and stir to make sure the chicken is coated in the spices. Cook for 1 or 2 minutes until the chicken warms up. Add the corn, black beans, green onions, cilantro and stir. Cook for 1 more minute until everything warms through. Add the spinach and roasted red peppers to the skillet and cook for a couple more minutes until the spinach cooks down. Remove from heat. In a small bowl whisk together the sour cream, blue cheese and the lime juice. Spread about 2 tbsp of the sour cream/blue cheese mixture over a flatbread evenly, then add about 1/4 cup of the chicken mixture and spread evenly over the flatbread. Sprinkle with some Monterey Jack cheese then roll the flatbread to form a wrap. Cut in half and serve. 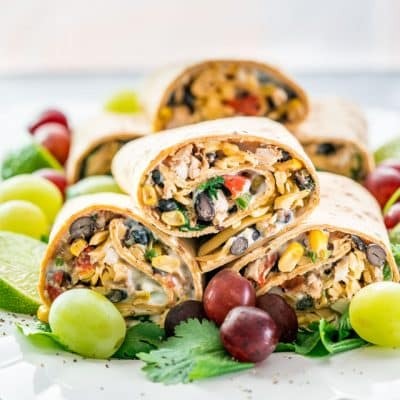 To store leftovers place the wraps in an airtight container and refrigerate for up 3 to 4 days. You can also wrap them with plastic wrap or wax paper and refrigerate. Made the Southwestern Wrap to take for lunches. This will last me a couple of weeks, so I portion to the freezer;-D Just as I was ready to mix the final ingredients, I realized that I was out of sour cream! Gadzooks! So I made an adjustment… I had about a cup of cottage cheese, and since I like to prepare everything the night before, I dumped the cottage cheese, bleu cheese, and the Monterey Jack into the pot. Then, after thoroughly mixing everything, I let it sit on medium heat for about five minutes and removed it from the heat. After it cooled a bit, I took a sample and it’s fabulous. When it’s completely cooled, I’ll make the wrap for tomorrow’s lunch, portion up another serving for a second use this week, and portion the rest to the freezer for lunches next week or so. I know all will freeze well as I’ve done something similar. I’m going to try the wraps both cold and heated and let you know. For what it’s worth, I’ve substituted cottage cheese before when making my sour cream-garlic mashed potatoes and no one knew the difference! LOL! Thanks for the recipe and next time I’ll make sure that I’m NOT out of sour cream! 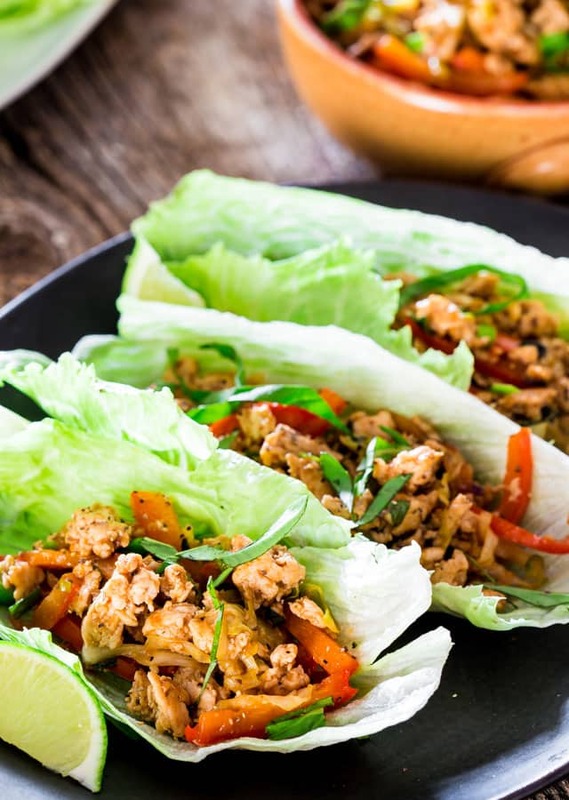 Hi Jo, just found your blog while looking for lettuce wraps. I’ve been following Nagi for a while now and look forward to following you as well. Jo, where can you buy Flatout now? It seems Safeway and Co-op in the NW no longer carry it. I love Flatout for a lot of different things. I don’t know where you live, but Food Lion carries them. They’re on the bottom shelf on the bread aisle and in the Deli section on the opposite side of the Artisan breads. 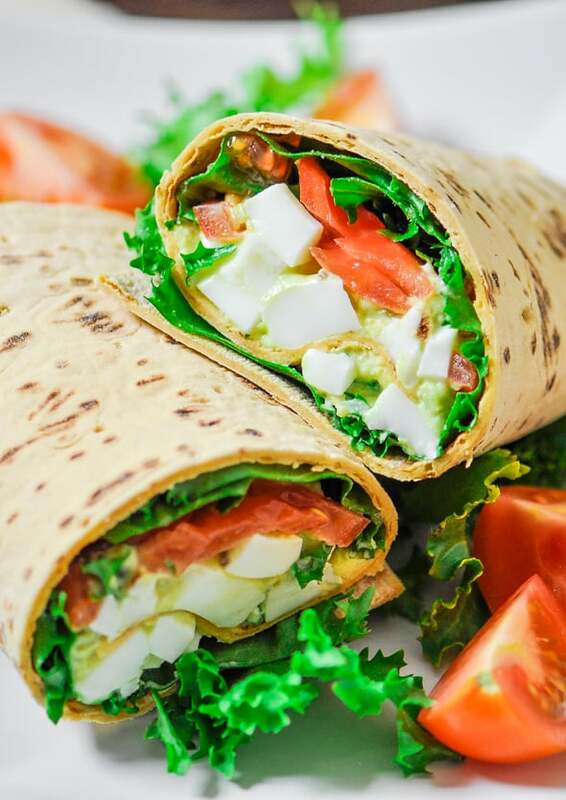 Love these – I’m trying to cut back on bread – so wraps are a great answer and these look delicious! These turned out delicious. Perfect for lunches.